Becontree Estate in Essex was built by the London County Council between 1921 and 1934 on four square miles of flat land, over half in Dagenham, a third in Barking and under a sixth in Ilford. 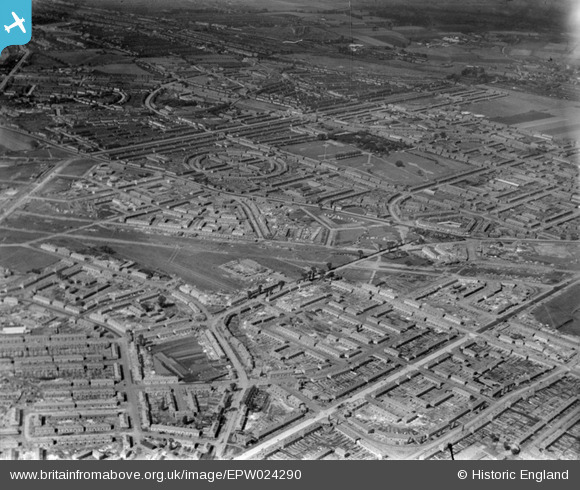 This huge housing estate provided nearly 27,000 homes for 90,000 people, and was reckoned to be the largest of its kind in pre-war Europe. The circular road is Valence Circus with Valence Park to the right. Below Valence Circus running from left to right is Wood Lane. In the centre, one third up from the bottom, are two groups of trees which are in Halbutt Street with the right hand group at the junction with the western end of Oxlow Lane. Just above the trees is the site for Halbutt Street School. Below the trees is Osborne Square. 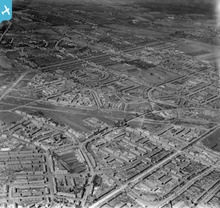 Between Oxlow Lane and where Halbutt Street meets the bottom of the picture is Heathway. Heathway appears to end at Oxlow Lane in this picture.